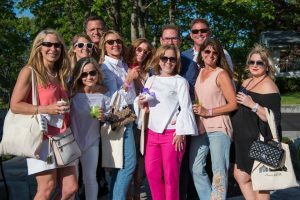 2019 marks year 15 of the Kennebunkport Festival to kick off the summer season with a week long festival of art, music, wine and fine dining surrounded by live music performances, and of course, the allure of Kennebunkport. 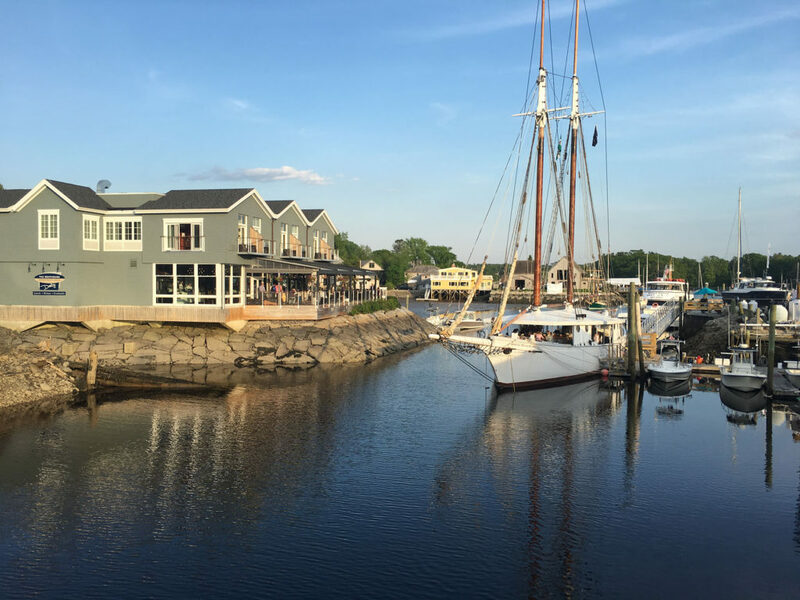 It’s the perfect time to vacation in Kennebunkport! 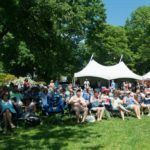 The 15th annual Kennebunkport Festival is June 3-9, 2019. 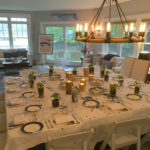 Its a celebration of all things uniquely Kennebunkport with its vibrant art, design and culinary scene. 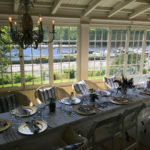 The Kennebunkport Festival is a fun, festive, charitable event. 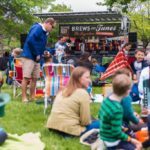 Charitable contributions vary from 100% of all ticket sales to 100% of net proceeds to charities. 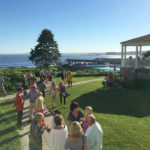 The goal for The 2019 Kennebunkport Festival is to raise $100,000, following 2018’s success of $81,000 that benefitted local Maine charities: COS -Community Outreach Services of The Kennebunks, Full Plates Full Potential, Animal Welfare Society, Habitat for Humanity of York County, and Maine Art Scholarship for the Arts of Kennebunk High School. 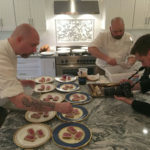 The Art of Dining Dinners are the signature Festival events- hosted in private residences. 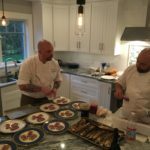 Top Maine chefs are invited into Kennebunkport’s unique homes where guests are treated to culinary courses paired with wine. The setting is complemented by artwork by local artists from the seaside community, and 100% of tickets go to the hosts’ chosen charity. 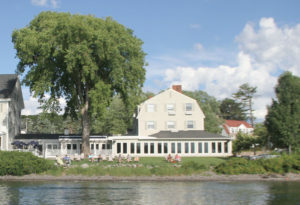 Tuesday & Wednesday June 4 & 5 – “Art of Dining Dinners” 7 – 10 pm – 100% of ticket purchase goes to a Maine charitable organization. 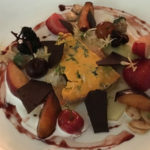 See the Full Schedule of exclusive Art of Dining dinners. 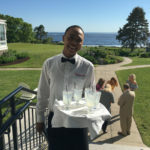 Tuesday June 4 – “Cocktails at The Burleigh,” 5 – 7 pm, 100% of Ticket sales benefit Community Outreach Services of the Kennebunks – a community assistance program supporting Kennebunk-Kennebunkport-Arundel. Tickets $35. 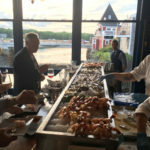 Wednesday June 5 – “Cocktails at Stripers” located at The Breakwater Inn, 5 – 7 pm, 100% of Ticket sales benefit Full Plates Full Potential. 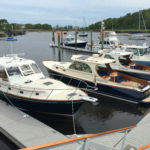 Thursday June 6 – “Cocktails aboard The Sprit of Massachusetts” – 5 – 7 PM – Sample passed appetizers, sip cocktails, and enjoy the scenic Kennebunk River. 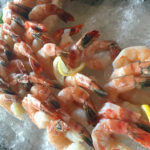 $35 to benefit Community of Caring. 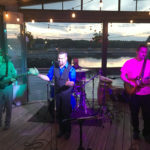 Thursday June 6 – “Oasis Party” at Old Vines Wine Bar 6:30-11:30pm – a fun, festive party. 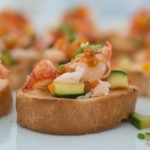 Music and dancing to Portland Superband “Hello Newman”, followed by a DJ Dance party with DJ Nate, hors d’ouevres buffet, inside and out on the patio and under the tent, copious food, drinks, wine, and signature craft cocktails – all included at $125, a portion of sales will benefit a local charity. 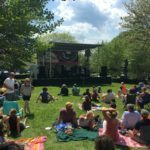 Friday June 7 – Maine Art Hill Block Party 5 – 7:30pm A lively, early-evening New Orleans–style block party at the newly re-imagined and expanded Maine Art Hill. 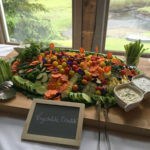 Hosted at Maine Art Hills 3 locations. 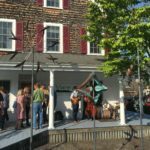 Browse art from boutique to gallery, at the new Maine Art Hill, enjoy New Orleans style food and live music at this open air party that pours out onto the streets, Tickets $55, to benefit Maine Art Hill Scholarship for the Arts at Kennebunk High School. 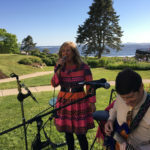 Saturday June 8 – “Summer Soiree at Vinegar Hill Music Theatre” 6-10pm enjoy food and drinks from Kennebunkport restaurants Earth, The Burleigh, The Dory, and The Boathouse all under one tented ‘roof’ followed by a Dance Party. Tickets $125, $175 for VIP Access. 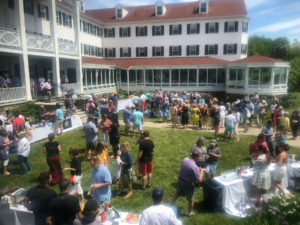 Sunday June 9 – Taste The Kennebunks 12 – 4pm This year’s Festival Grand Tasting at The Colony Hotel offers an afternoon of sampling and sipping for a good cause. 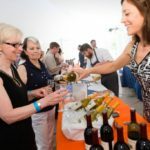 Over 20 local restaurants, eateries, artisan ice cream makers and bakeries offer their signa­ture dishes to sample as well as 20 plus distinctive wineries, craft brewer­ies and distilleries pouring tasty sips to compliment the culinary bites from around Maine. 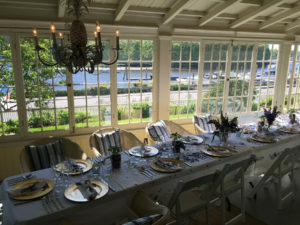 Enjoy this lavish setting overlooking the Ocean at The Colony, a grand party at a grand old hotel, $65. 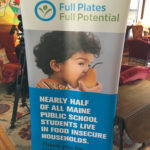 Charity benefit Good Shepherd Food Bank of Maine. 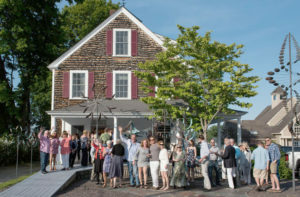 Overall, The Kennebunkport Festival is a memorable Maine event, a fun fundraiser, in its 15th year in 2019, where you can enjoy live entertainment from local musicians, view inspiring Maine art, taste delicious Maine cuisine and and sip cocktails, for an entire week at varying locations. 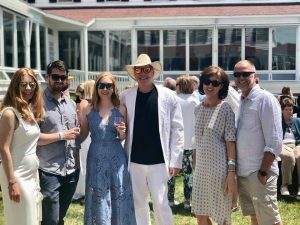 The Kennebunkport Festival fashions are always fun too, as locals and guests dress to impress… beyond the usual Bean boots and Kport t-shirts. 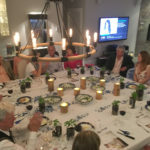 Why aren’t there any house part dinners? Those were always great. There will be – working on full schedule.